Fyll i samtliga fält nedan. Välj speldatum, starttid, antal spelare och Hcp (handikapp från lägsta till högsta). PGA PRO gäller enbart för professionella PGA-spelare och skall INTE vara medräknade i fältet Spelare. The golf course in Mar Menor Village Golf is located in the province of Murcia, near the town of Torre Pacheco. The course surface is approximately 59 hectares and has a maximum length of 6,153 meters for quite a demanding par 72. The green area or playing area is 45 hectares; the rest of the areas are gardens with a variety of indigenous plants of this area. The golf course is located 5 Km from Mar Menor, a privileged area due to the beauty of this immense inner sea. If you decide to play on this course that has been designed by two great worldwide golf players, you may enjoy two playing sensations on the same course. 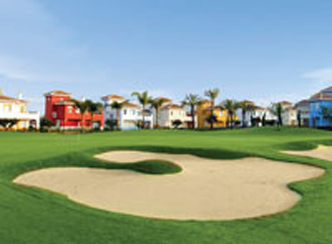 David Thomas designed the first nine holes of Mar Menor Village Golf, par 37 of 3,275 meters as its greatest distance. It demands good strokes to put the ball on its courses with hardly any rough, its greens are well protected by bunkers and by the water of the lakes around the course. The second nine holes that were designed by Nicklaus Design are par 35 of 2,878 m, as its greatest distance, it has wide courses and wide roughs that allow big strokes. The spectacular lake around holes 13,14 and 15 deserves special mention, making the water the greatest obstacle to be overcome. The rest of the holes are protected by strategic bunkers. Kontakta vårt kontor för golfpaket på deras hotell eller lägenheter och spela deras 6 Jack Nicklaus banor (Mar Menor, Saurines,La Torre, Hacienda Riquelme, El Valle och Alhama golf).